Journalists with CBC British Columbia have taken home four prizes from the annual Jack Webster Awards in Vancouver. 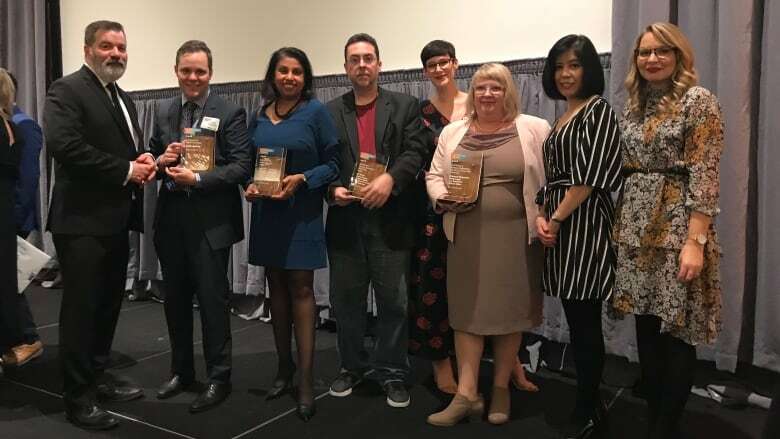 Journalists with CBC Vancouver have taken home four prizes from the annual Jack Webster Awards. The awards, named after the legendary broadcaster, honour the best reporting across B.C. Stephen Quinn, Lee Rosevere, Drew Kerekes, Bridgette Watson, Jake Costello, Yvette Brend, Claudia Goodine, Michelle Eliott, Theresa Duvall, Chris Robinson, Rob Zimmerman, Rafferty Baker and Megan Thomas for CBC Radio One's "The morning Canada bought a pipeline." Johanna Wagstaffe, Polly Leger, Lee Rosevere and Shiral Tobin for CBC Radio One's 50 Degrees of Change. Bal Brach, Stephen Quinn, Lee Rosevere, Matt Parsons and Laura Palmer for CBC Radio One's SOLD! Real estate round up from CBC Vancouver's new podcast, SOLD!